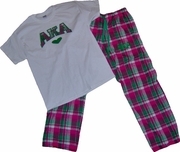 Adorable tee for sleeping or not...add coordinating flannel boxer shorts or pants to complete the outfit. Sooo comfy! Tees feature flannel lettering, twill heart and letter backgrounds. Even upgrade you tee to a lightweight hooded sweatshirt to wear in cooler weather. Bottoms feature coordinating 2 inch twill greek letters stitched onto the front of the left leg.